How very very wonderful!! 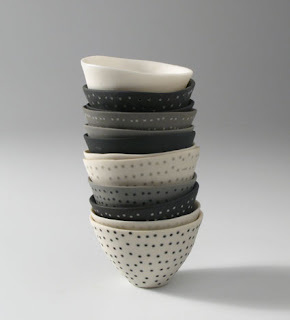 Puristic clay-love, nothing added- I love that. 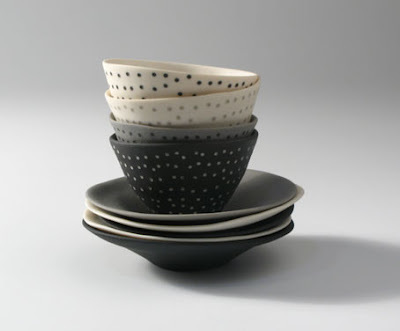 Thanks for commenting on my blog as now I have found your beautiful ceramics!! Oh mannnnnn, I love these bowls. Just ace! time consuming or not, these ones are worth it! gorgeous! could you get a similar effect by painting the little dots of other color clay in your mold before casting? That grey color is marvelous! these are beautiful & what an interesting technique to make them. They look AWESOME!! Nice work! aw thanks everyone! So it wasn't just me who liked em! Carol, I probably could paint the dots on my mould (that's how i do most of the colour on my pieces). I had originally planned on doing just a line around the outside rim, but once i'd started....!! And as finicky as it was I did just enjoy playing with that process. Uschi, probably a bit of both! Cristina, yes most of my work LOOKS very fragile, but it is much stronger than it looks! The beauty of porcelain! Thanks Janick, and Hi Shannon!! I love these a lot. My grandmother had rice-inlay china when I was little. she said the potter would press rice grains into the wet clay in a pattern, and they would vaporize during firing, leaving a lacy thin/thick/holey pattern. your dots look like light goes through them they are so fine. mel, I fell in love with your porcelain pieces as soon as i came upon this blog, especially these bowls, such delicate beauty! Love, love, love them all. Your stuff is great Mel! It must of taken ages to do those uns with all that drilling! Just outstanding work you, very beautiful!